This was a recent article on sodium selenite benefits by NaturalHealth365. Sodium selenite benefits are proven when it comes to helping people heal from cancer. We administer this organic compound here at our healing center. We use this wonderful compound in addition to our other intravenous therapies that challenge cancer at a metabolic level. Enjoy this article as it clearly shows how sodium selenite can potentially reduce the risk of cancer by 50%. An organic compound of selenium (Se), L-selenomethionine, has been shown in studies to literally halve your chances of dying from cancer, slashing the risk of cancer by an amazing 50 percent. L-selenomethionine is one of three forms of selenium shown to play a role in preventing, and even halting, cancer in humans. While the different forms of organic and inorganic selenium – and the ways in which they work to prevent cancer – can seem complicated, you don’t have to be a biochemist to benefit from supplementation with this vital trace mineral. Combining the three forms together is the key to attaining maximum chemopreventive benefits. Selenium is an essential mineral and trace element utilized by the body as a co-factor. It works to recycle and re-use disease-fighting antioxidant enzymes such as glutathione, which neutralizes damage from free radicals. Selenium is also necessary for proper thyroid function. Studies have supported the role that adequate levels of selenium play in helping protect against two of the most common forms of cancer: prostate and colorectal cancer. Low selenium levels are associated with a two to threefold increase in overall cancer risk, particularly cancers of the bladder, esophagus, lung, stomach and liver. Inadequate levels of selenium can cause a shocking 8-fold increase in risk for thyroid cancer. Research has shown time and time again that supplementing with selenium lowers cancer rates overall. A 2011 analysis of clinical trials involving over 152,000 participants demonstrated that selenium supplementation cut cancer risk by 24 percent in other words, supplementation protected almost 40,000 lives from the toll exacted by this devastating disease. With the tongue-twisting name of L-selenomethionine, this organic complex consists of selenium combined with the amino acid L-methionine. Found in most preparations of selenium-enriched brewer’s yeast, L-selenomethionine is the form most commonly used for clinical trials. Perhaps the most heartening research on L-selenomethionine’s ability to prevent cancer came to light during a 1996 study, originally intended to explore whether or not 200 mcg a day of L-selenomethionine could prevent basal and squamous cell skin cancer. The compound was found to be ineffective against skin cancer, but researchers discovered that it did something better – protected the study’s supplemented group from dying from cancer, at the rate of 50 percent less, when compared to the control group. It also caused a 37 percent reduction in the risk of developing any form of cancer – particularly lung, colorectal and prostate cancer. The results were so astonishing that the study was stopped early – a very unusual turn of events – in order to allow all participants to benefit from L-selenomethionine supplementation. Further research showed that supplementation with L-selenomethionine could cause a reduction of between 63 to 74 percent in prostate cancer rate, depending on the men’s prior histories and levels of PSA, or prostate specific antigen. Yet another study of patients with precancerous changes in the esophagus demonstrated that 200 mcg of L-selenomethionine slowed the progression of potentially cancerous cells, while triggering regression of pre-cancerous cells to normal. How does Se-methyl L-selenocysteine help cancer patients? This organic compound of selenium, which is paired with L-cysteine, is a sulfur-containing amino acid with specific cancer-fighting abilities. One of its most striking benefits is that it inhibits the ability of tumors to form new blood vessels – thereby dramatically reducing tumor growth. Researchers are also impressed by the compound’s ability to enhance the effects of chemotherapy on tumors. Sodium selenite, an inorganic form of selenium, generates toxic reactive oxygen species and destroys cell mitochondria – functions that would ordinarily be harmful. Yet, amazingly, sodium selenite confines its destructive effects to tumor cells – not the healthy cells in normal tissue. At the same time, sodium selenite stimulates the activity of antioxidants in healthy tissue, protecting it from damage by free radicals. It also promotes repair of damaged DNA, curtailing new cancer development. In one clinical study, researchers found that sodium selenite caused patients with aggressive head and neck cancers to experience heightened activity of the immune system, substantially increasing the destruction of tumor cells. Like selenium methyl L-selenocysteine, sodium selenite can increase the effectiveness of chemotherapy – by up to 50 percent. In a 2000 study of Chinese men living in high-risk areas for liver cancer, 500 mcg of sodium selenite daily for three years reduced the occurrence of new cases of liver cancer by 50 percent. 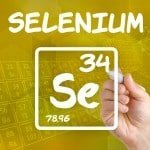 Selenium’s many different methods of preventing potentially cancerous cells from developing into full-blown tumors make it a valuable weapon against the disease, as cancers have their own multiple mechanisms and pathways – allowing them to easily prevail over single-targeted therapies. These mechanisms include suppressing the inflammatory molecules that promote cancer growth, recycling antioxidants to reduce oxidative stress, detoxifying carcinogenic toxins and heavy metals and inhibiting the alteration of DNA. Selenium also stops cancer in its tracks by terminating cancer cells’ replication cycle, limiting tumor invasion and growth, and inducing apoptosis – or cell suicide – in malignant cells. The exciting ability of these three forms of selenium to wreak their destruction on cancer cells, coupled with their beneficial effects on the immune system, make this mineral an indispensable weapon in the battle against cancer. This article first appeared on NaturalHealth365 with additional references.